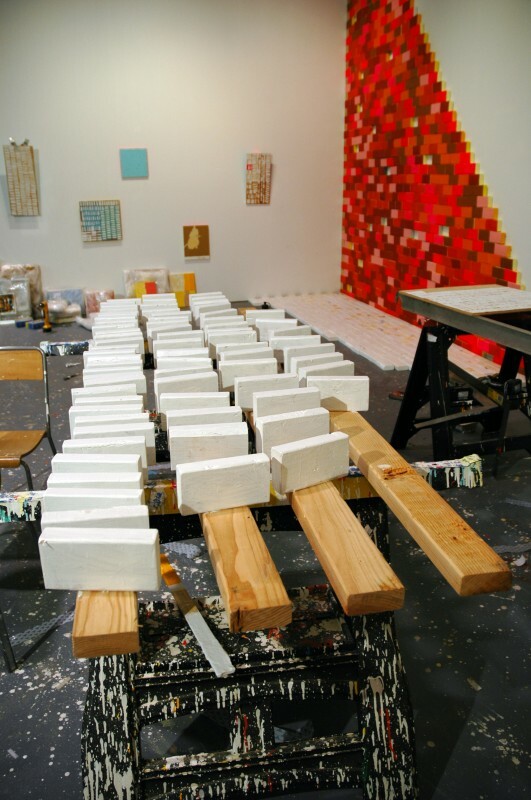 For his first solo show in LA, and with Mark Moore Gallery, Cordy Ryman is sure creating quite a buzz. In addition to being featured in the Nerman Museum of Contemporary Art’s “Aberrant Abstraction,” which was recently reviewed by the Kansas City Star, “Hail to the Grid” here in Santa Monica was the subject of positive review by Allison Gibson of Daily Serving, Sasha Lee of Beautiful/Decay and Heather Jeno Silva of Flavorpill. Be sure to come see the show before the gallery closes for the holidays on December 19th – January 4th! Surely, by now, you’ve heard about Allison Schulnik‘s fifth full-length animated video. Grizzly Bear used it for their most recent music video, Pitchfork raved about it, and the NY Post asserted that Bjork had to be jealous about its psychedelic qualities. If you’re in the LA-area, you have a chance to see it for yourself on the big screen! 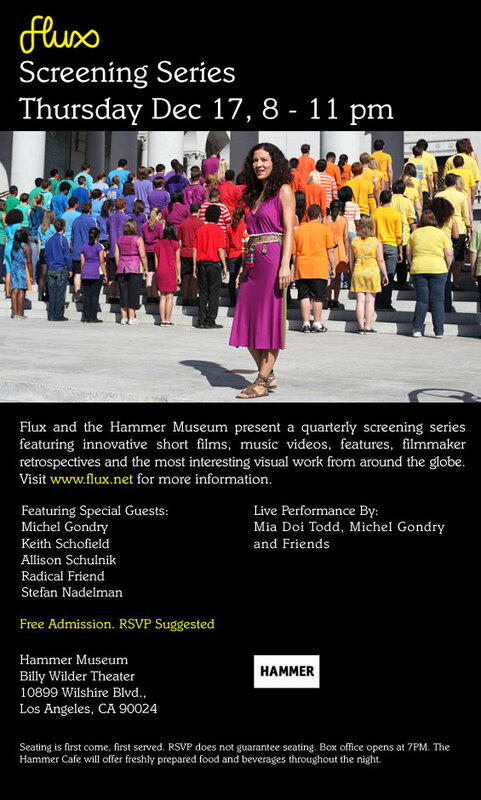 As part of their Flux series, the Hammer Museum hosts video greats Michel Gondry, Keith Schofield, Radical Friend and Stefan Nadelman with MMG’s Allison Schulnik – who will screen “Forest,” in addition to a performance by Mia Doi Todd, Michel Gondry and friends. While admission is free, RSVP is strongly encouraged. Mark your calendars for next Thursday, December 17th, from 8-11pm! You won’t want to miss this one. …and we haven’t quoted LMFAO once. Well, in public at least. Our second day in Miami has given us a better sense of what lies ahead, and optimism is at an all-time high. MMG’s Jason Salavon arrived at the booth this morning – direct from Chicago – to install his video piece (which is stunning, might we add). With that, the booth was complete. Voilá! After tying up some loose ends in B-202, and averting the near fatality of a black blazer due to some rogue white paint, we were on our way to the Art Basel VIP Preview and Vernissage. After stepping out of the cab (sunglasses instantly fogged over from the humidity), we found ourselves in the entrance of the cavernous ABMB fair; which was a labyrinth of over 250 galleries, Michael Jackson references, Kehinde Wiley, Christian Laboutin shoes and Perrier Jouet on wheels. Highlights included Cherry and Martin’s solo booth of new Amanda Ross-Ho canvas works, Jack Shainman’s elaborate wall of Nick Cave soundsuits (as well as El Anatsui’s intricate aluminum works), Roberts & Tilton’s gorgeous Wiley painting, Deitch Projects’ glass Barry McGee wall piece, Charim Galerie’s solo booth of Valie Export works and hilger Contemporary’s luscious Massimo Vitali photograph. Four and a half hours later, we had seen about 52% of the fair; but gave a valiant effort nevertheless…and surrendered to dinner needs. As we prepare for our very own VIP Preview Brunch tomorrow morning at 10 am, we will continue to report live from PULSE Miami via Twitter. The fair has already generated some pre-opening buzz, which you can read about on ArtNet, Miami Magazine, Miami Herald, The Lead Miami Beach and Whitewall Magazine. We came, we saw, we conquered….our booth, at least. Day one of PULSE Contemporary Art Fair: Miami leaves us void of complaints and thrilled with the works we brought along. PULSE’s new location at the Ice Palace is absolutely perfect and pristine; not to mention the fabulous turnout of established and emerging galleries alike. Check out some of the photos from our day (excuse the quality, had to snap ’em quick with the iPhone amongst installation) – and if you’re in the area, please visit us in Booth B-202, December 3 – 6th!